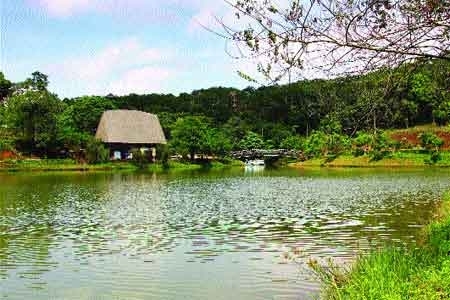 Home to a delicate blend of ethnic tribes, exotic wildlife and breathtaking scenery, Mang Den Ecotourism site in Kon Tum Province offers an unforgettable sensory experience as yet untouched by the outside world. 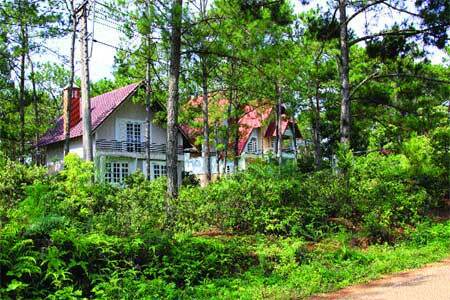 Water view: Idyllic Dac Ke Lake surrounded by pine trees in Mang Den Ecotourism Site, Kon Tum Province. Lush forests, alluring lakes and waterfalls, purple sunsets, misty sunrises… the Mang Den Ecotourism site has all this and much more 12 kilometres. 120 sharp bends. The sharp bends through the pine forest at a height of nearly 1,000m above sea level should have been thrilling, exciting, even a bit scary – at least enough to get some adrenalin flowing, but as adventurous as the ride was, I was strangely at ease. For the comfort of visitors, several dozen villas have been built in the midst of the pine tree forests by local authorities, who have said they will ensure that constructions in the site would have minimal impacts on the site’s pristine nature. Mang Den is not just a beautiful place. It is also sacred land. On the highest hill in the area stands the statue of “Our handless Blessed Mother Mang Den”. The one-meter tall statue attracts more and more pilgrims every year. At the foot of the statue I saw numerous stone and wood tablets of different sizes that said, “Thank You, Blessed Virgin Mary”. I am not Catholic, but I felt a sense of gratitude as well as I contemplated the Mother and sought her blessings. 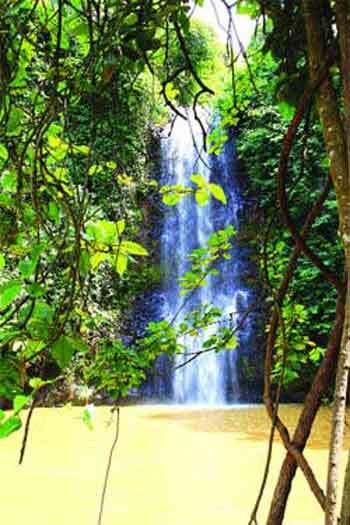 Mang Den’s cup of beauty overflows with the Tu Rang, Nuoc Ka, Dac Ke and Pa Sy waterfalls and rapids. After climbing around 100 steps that are somewhat steep, one can contemplate the wonder that waterfalls are. Watching the water, effortlessly, but with great power, cascade from a height of about 50 metres at the Pa Sy waterfall, I thought, this is really what “go with the flow” means. Another major spiritual landmark in the area is the Khanh Lam Pagoda, that was under construction when I went there. On the 10ha premises stands an 18-metre tall statue of the “Bodhisattva of Mercy”, evoking in the devout a feeling of compassion for all sentient beings. The M’Nong, Xo Dang, K’ Dong and Hre people, for whom Mang Den is home, have preserved well their traditional lifestyles and distinct culture and customs, not to mention their traditional crafts. Adding to the joy of discovering Mang Den was meeting with the ethnic communities and admiring their creations – brocade made by the M’Nong, several handicraft items made by the Xo Dang with simple, ingenious production tools, and sophisticated metal products forged by the K’Dong. Huynh Kim Phuong, a tourist guide in Mang Den, told me that wild vegetables cooked with sturgeon, wild banana inflorescence tossed in oil and vinegar, dried buffalo meat, bamboo rice and wild chicken baked with “e” leaves are Mang Den specialities that visitors should not miss. “Mang Den cuisine is not complicated, but the dishes are delicious since they are prepared with the local forests’ offerings,” Phuong said. “Mang Den has become increasingly well-known in recent years. In 2012, we received over 50,000 tourists, up 150 per cent over 2011, most of them from Can Tho, Vung Tau, HCM City, Binh Duong, Dong Nai, Quang Ngai and Gia Lai,” said Nguyen Duc Tuy, a senior official of Kong Plong District. 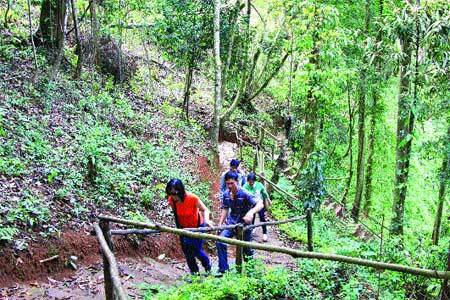 Visitor Dang Le Lanh from Kon Tum City told me: “I have visited Mang Den three times. All the stress of working is washed off completely whenever I get here. “My first impression of Mang Den was that it is so quiet that it is only suitable for older people. “I have visited many places in Viet Nam. Your country is extremely charming but Mang Den may be the most attractive for me. I like the vast primeval forests, the fanciful sunsets, the mysterious roads running through the jungles, and the veil of mist at sunrise and sunset. Mang Den is a part of the “Green Road in Central Highlands” tourism route, connected to the “Central Heritage Road” and “Legendary Ho Chi Minh Trail” that make up the transnational “Indochina Heritage Road” linking world heritage sites in Viet Nam with those in Laos and Cambodia. 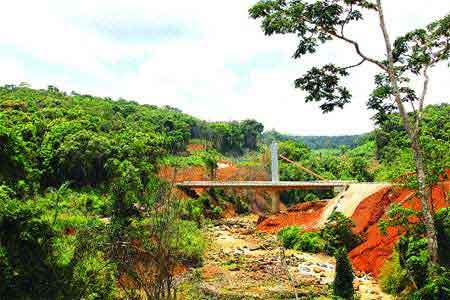 Tuy said that to fully tap Mang Den’s potential, the Prime Minister early this year approved a master plan to turn it into a national park, nature reserve and tourism zone. As I left, I felt both confident and hopeful that this dreamland will retain its magical qualities and unstintingly offer to all seekers its gifts of stunning natural beauty and natural peace and quiet.